Domain owners identify their authorised mail servers to the domain name service in DNS records. 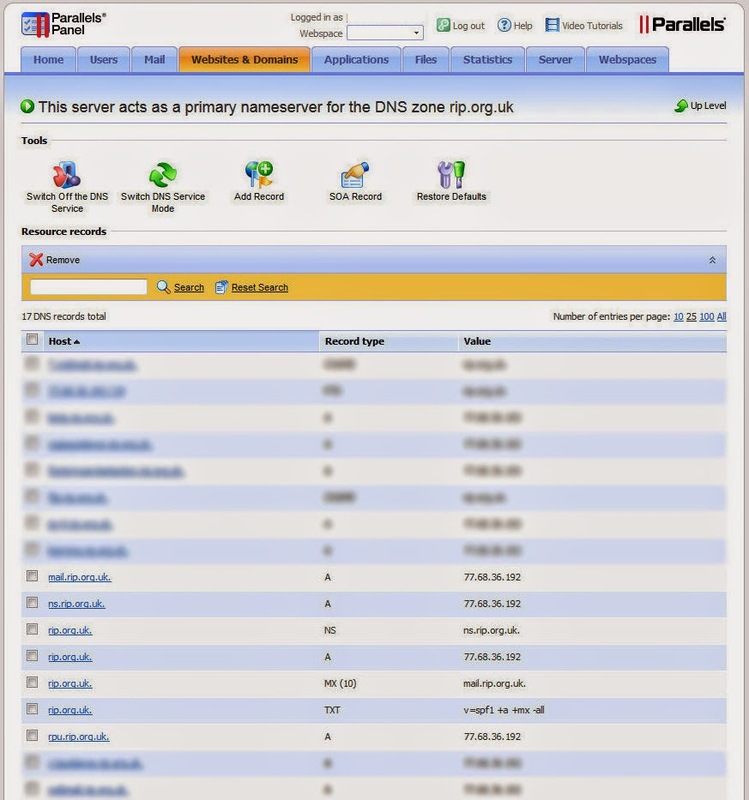 Inbound mail servers use the DNS to check that mail from a given domain is being sent by a host authorised by the outbound domain's administrators. SMTP receivers verify the sender address against this information, and can distinguish authentic messages from forgeries before any message content is transmitted. What is attractive is that SPF is implemented at the level of outbound DNS TXT records and can be queried by the inbound SMTP server. Whilst you can find detailed information on SPF record sytax at http://new.openspf.org/SPF_Record_Syntax this is a quick example of the basic SPF TXT record you could use. We'll look at this on Plesk, but as long as you can find the DNS records section of your domain, this works equally well for other server panels. Using the Plesk Control Panel, we log in as admin and select the domain for which SPF is to be configured. From there, selecting Websites and domains displayed the records configured for the particular domain URL. If there is no TXT records, you may need to select Add Record to, errm, add a record. You can also select an existing record to edit it. domain.com IN TXT "v=spf1 spf_string"
"a, ptr, mx, ip4, include, all"
Here, all is a closing argument and must be placed at the end. domain.com IN TXT "v=spf1 mx -all"
This means that mail from mailuser@domain.com can be sent only from the parent server (parent MX record). Other servers may be configured to send mail as @domain.com, which can be set using 'arguments' to the a:, mx:, ip4:, and ptr: options. "v=spf1 a mx a:test.com -all"
Mail can be sent from the parent domain MX and additionally from test.com server which is an 'authorised' sender. domain.com. 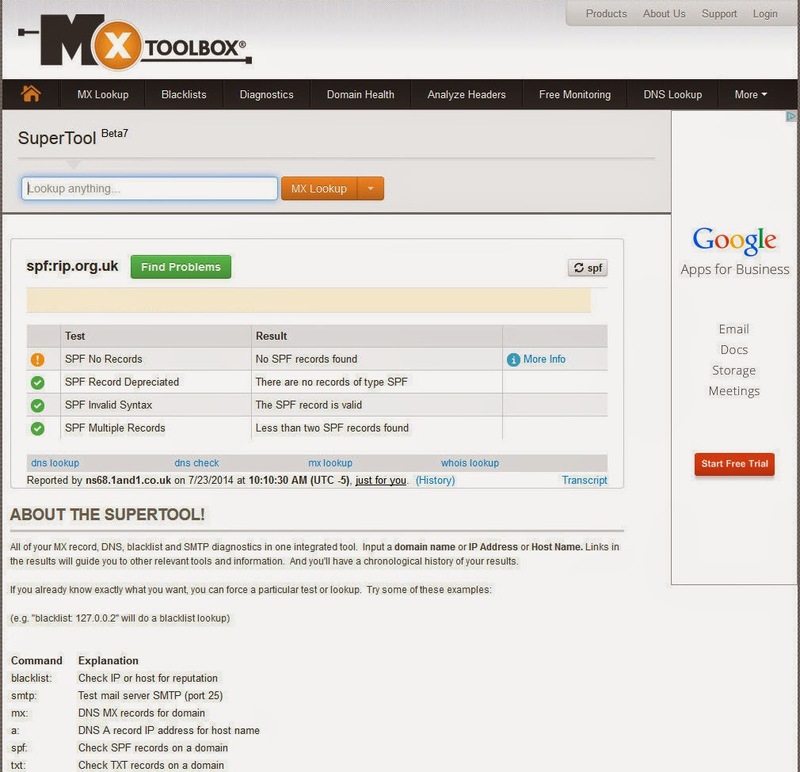 10800 IN TXT "v=spf1 a mx ptr ip4:77.68.32.192 mx:mail.domain.com -all"
If you're not sure what is currently authorised and can't go straight to your MX records, there are a number of online tools for checking what is publicly configured for a given domain.